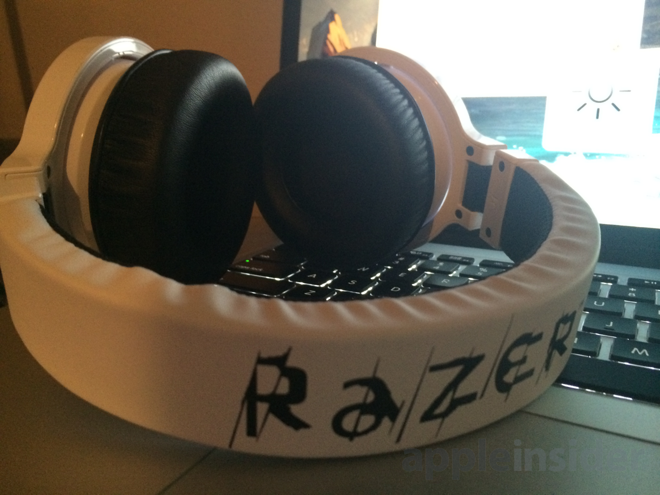 Razer is not known for its subtle designs and the Kraken Pro is no exception. In fact, the company has banked on this "love it or hate" philosophy to carve out a nice niche for itself in the crowded computer peripherals market. I suspect Apple aficionados will fall on the "hate it" side of the equation, associating the bright plastic facade with early- to mid-2000s Windows machines than anything out of Cupertino. But do the features and sound quality make up for the Kraken Pro's gaudy looks? There are a few main things I look at first when determining the build quality of a pair of headphones: does the headband readily contract and expand; are the cans firmly attached; and does any wiring show potential for breakage. Combing over details like these helps spot potential weak points that could turn into big problems down the road, when the headset is put under strain. Heavy use can transform a pair of otherwise respectable headphones into a duct-taped amalgamation in the span of one good Pudge hook. Thankfully, the folks at Razer seem to understand their audience and have built a headset that feels like it could take a decent amount of abuse. Primarily made of hard glossy plastic, the chassis feels solid in the hand, but is decidedly short of earning the 'premium' moniker. I couldn't shake the feeling that the Kraken feels a bit like a Transformer from the late '80s —after they stopped making the great die-cast metal ones. Despite the lightweight feel, I'd feel comfortable dropping the Kraken Pro or just tossing it aside after a really long gaming session without too much concern. The plastic may scuff up a bit after extended use and abuse, but it's not going to crack or break without some effort. Razer has opted not to allow the ear cups to rotate, but instead has placed a hinge at the base of the height adjusters so they can "collapse" up into the headband. Presumably for portability (which is a recurring theme with this headset) but because the pads on the cans are so thick and the attached wire is in the way, it just doesn't work very well. Don't get me wrong, it's hard to fault Razer for not allowing the cups to swivel on their joints, it's not a common practice for headphone manufacturers. It's a pet peeve of mine though, because it leads to one singular problem that has plagued headset owners for ages; If you accidentally sit on these things, they will probably snap. It would have been nice to see them put some measures in place for this eventuality, but it's hard to deduct points for it. Maybe next time. 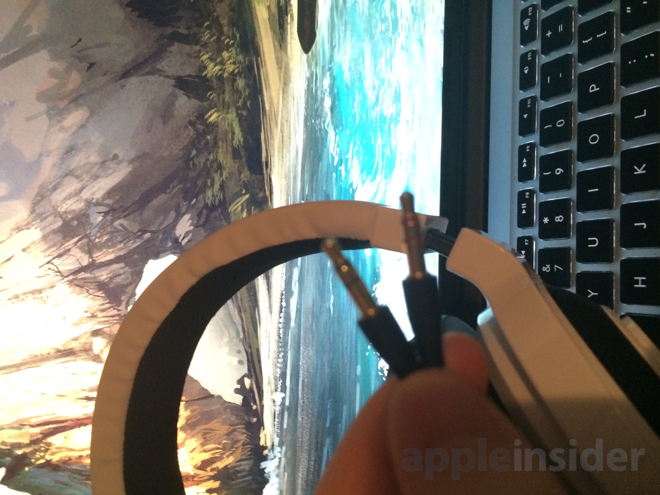 The weak point of the headset will end up being the cable connecting into the device itself. How many times have you tugged on the cable to bring your headset closer when it's just oh-so-slightly out of reach? Perhaps you've jumped up in excitement only to be violently yanked back down by the cord? It's OK to admit it, we all do it every now and again. Video games are exciting. Many device manufacturers have remedied this and given it ornate marketing names like 'Magsafe' or 'breakaway cable'. Regardless of what it's branded or implemented the intent remains the same; Make it easy to disconnect or even replace the cable should your users get overly rambunctious or grossly lackadaisical. Razer could take some cues from other manufacturers here. If you're an overly animated gamer, try and stick close to whatever you're tethered to. The retractable microphone that slides in and out of the left earmuff is nice touch, and meant to encourage you to use these headphones places other than in front of computer or TV. It slides in and out with a semi-solid bendable cord so that you won't look like you're contacting mission control while out in public, and makes toting them around a bit easier. The headset is meant to hug your head tightly, and it does. This is meant to lock in as much sound as possible while isolating you from the outside world. The ultra-thick foam pads help a lot, but these are not active noise cancelling headphones. They do a decent job of insulating you from the outside, but you will absolutely hear anything loud near you, be it a sax battle on the subway or the dull roar of an airplane if you're too close to the engines. There is no doubt that these headphones leak sound like crazy, too. People will hear what you hear, so cranking up the volume to block out the rest of the world is going to result in everyone knowing that you're still listening to 'Call Me Maybe' on repeat. Carly may croon that "It's hard to look right at you baby", but people will still stare. It's a mixed bag. On the one hand it's good that they took the initiative to try and isolate the listener more, but I personally found the headset to feel a bit too constricting on longer play sessions (4+ hours) and removed it multiple times just to give my head a breather. If, however, you're the type of gamer who plays in one to two hour increments then you should have less of a problem. In terms of heft, the headset feels heavy and sturdy in your hand, but while resting on your head it's mostly forgotten. The headband is mostly unremarkable, with the exception that it only has a very thin layer of padding on the underside. This will affect you more or less depending on your head shape. I found it to not matter, but I've no doubt others will take issue with it. Overall I think most people will be fairly happy with the feel of the Krakens, depending on how long they plan to spend gaming. Razor claims that it's the "most comfortable gaming headset ever" on their website, but I respectfully disagree. Taking them off every hour or two just to give your head a break is probably a good idea. Maybe taking a break a couple hours is a good idea anyway. If you're looking for a well rounded pair of headphones, look elsewhere. Make no mistake these headphones are made for gaming first and foremost. Some would call the bass "punchy," but I would call it overzealous to a fault. This is a valid choice for gaming when bullets are whizzing by, gunshots are constantly going off, monsters are gnawing, super powers are charging, and there are explosions everywhere, but it absolutely devastates a good tune. On top of being overly punchy, I found the bass to sound hollow, with very noticeable distortion at higher volume levels. The highs are mostly well realized at all volume levels, but the mid range sounds poorly defined, like it's being encroached on from both above and below. The soundstage feels extremely claustrophobic as well, which leads to the unfortunate side effect that you are listening inside a small enclosed space —think the inside of a motorcycle helmet. Whomever balanced the audio levels for these headphones had some very specific environments in mind, and as a result they just don't pass as a good all around set of cans. If your intent is to use the headset primarily for gaming, then the balance is alright and you're less likely to notice any major flaws. If, however, you're going to do any music listening that overzealous bass and the clipped mids will make your favorite song sound kind of gross. It's worth noting that tested happened on systems with no EQ or audio effect processing for the sake of raw uniformity across platforms. You could potentially EQ some of these annoyances out. 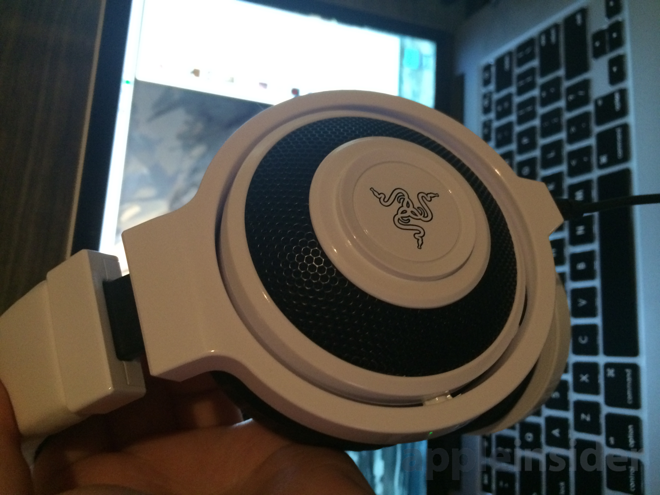 Razer wisely chose to include a unidirectional microphone on the Kraken. That means less sound from other sources, and more directly from your face. 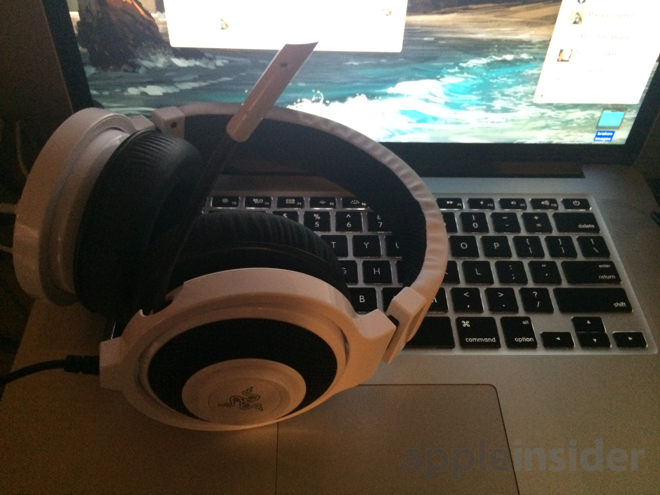 Though not noise canceling, it does a pretty good job of blocking out ambient noise. During testing the microphone had no problem picking up my voice loud and clear - unfortunately it also picked up my mechanical keyboard as well. This is a pretty standard state of affairs though, and the microphone is of a fairly high quality for this type of device. 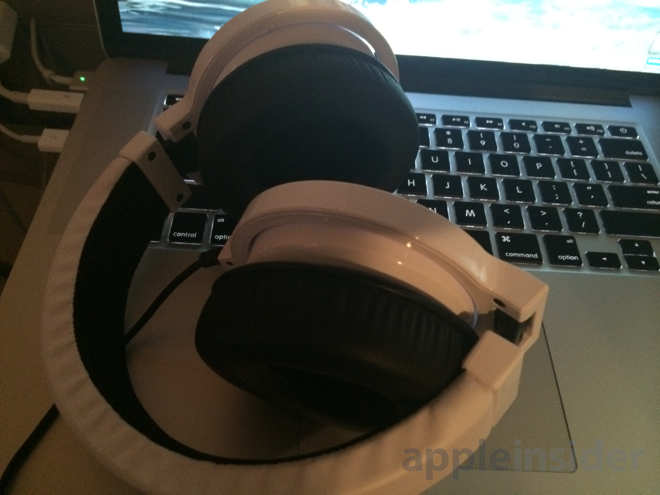 OS X: Tested on 2012 Retina MBP, connected into the dual-headphone/audio-in jack. Tested with Teamspeak, Mumble, Skype, Ventrilo and Steam. No issues. Windows (8.1) (Xonar Essense STX): Same as above. 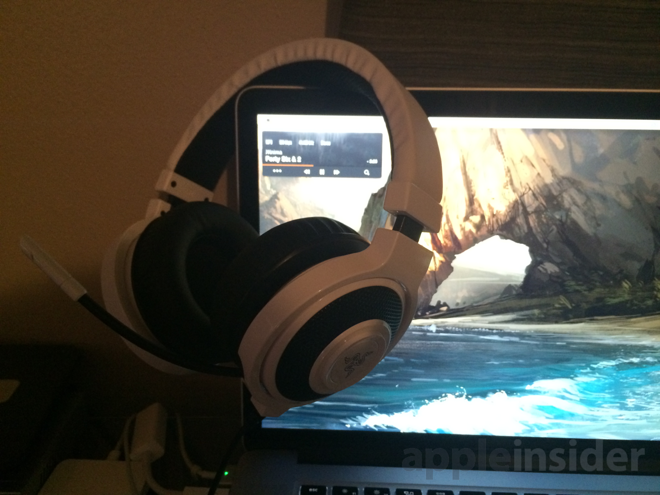 Tested on all the same applications as OS X.
Xbox One: Works like a headset should. Unfortunately, due to the way Microsoft designed the Xbox One controller, you will have to buy a $30 adapter to be able to plug this in. PlayStation 4: Just plug it into your DualShock 4 and go. Works seamlessly with the system. iPhone 5s: It even worked here. Tested using the mumble app. If you're running late for a raid and need to get on with your guild mates to coordinate (a scenario which i find more compelling than i'd care to admit) you're covered. There's a lot of factors to take into consideration when looking for a headsets. What your price range is, what level of compatibility you need, how important is sound quality vs the quality of the microphone, etc. Razer has come up with a combination in the Kraken Pro that will hit the mark for a lot of people looking for a mid-range, highly compatible all-in-one solution. My main concern is the quality of the audio. For all its focus on portability you would think that Razer would have spent more time making this a much more sonically rounded headset. If you're looking for a general use pair of headphones to pair with a desktop or mod mic, there are much better options above and below this price range. If your primary concern is an all-in-one headset with high device compatibility and gaming as a primary focus then it's worth considering the Kraken Pro. Just have a listen to them first and decide if you can endure that super bass. The Razer Kraken Pro retails for $79.99 when bought directly from Razer, but is currently available at Amazon for a discounted price of $54.50.